Marcus Oliver Johnstone Mumford (born 31 January 1987) is an English singer, songwriter, musician and record producer best known as the lead singer of the band Mumford & Sons. Although identifying predominantly as English, he also holds American citizenship due to his place of birth. He also plays a number of instruments with the group, including guitar, drums and mandolin. Mumford was born on 31 January 1987 in Yorba Linda, California to English parents. As a result, he has held both British and US citizenship from birth. Mumford has an older brother, James. Mumford's family moved back to their native England when Marcus was six months old. He grew up in Wimbledon Chase, southwest London, and was educated at King's College School in Wimbledon, where he met future band member Ben Lovett. He returned to London to focus on his music career after his first year of study at the University of Edinburgh, where he collaborated on Mumford & Sons' debut album, Sigh No More. He began his musical career playing drums for Laura Marling on tour, along with the other current members of Mumford & Sons. It was through touring with Marling and gaining experience playing gigs, as well as experimenting with his early writing that they decided to form the band in 2007. 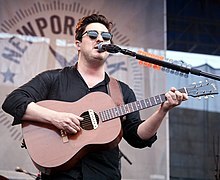 Mumford was included in the Forbes 30 Under 30 list of music stars in December 2012 for his achievements with Mumford & Sons. Forbes commented of the list which also included acts such as Adele and Rihanna: "In sum they represent the entrepreneurial, creative and intellectual best of their generation. Individually, they are engaging, surprising and incredibly hardworking." Mumford sang a cover of "Dink's Song" with Oscar Isaac for the 2013 Coen brothers film Inside Llewyn Davis. Although Mumford is not seen in the film, he voices the protagonist's musical partner, Mike, who commits suicide before the beginning of the film. Mumford is featured on the 2014 collaborative album Lost on the River: The New Basement Tapes, with other artists including Elvis Costello, Rhiannon Giddens, Taylor Goldsmith, Jim James, Jay Bellerose, and T Bone Burnett. Mumford takes co-writing credits on tracks, "Kansas City", "When I Get My Hands on You", "The Whistle Is Blowing", "Stranger", and "Lost on the River #20". On 23 September 2014, the video for "When I Get My Hands on You" was released and features Mumford on lead vocals. Mumford & Sons' third album, Wilder Mind, was released on 4 May 2015. Mumford & Sons' fourth album, Delta, was released on 16 November 2018, featuring appearances from Maggie Rogers, Yebba and Gill Landry. In 2014, Mumford produced Hold Fast by Christian Letts (Edward Sharpe and the Magnetic Zeros), released February 2015. Mumford co-wrote 4 tracks from the record - "Copper Bells", "La Mer", "Emeralds" and "Matches". Mumford produced the album Gamble for a Rose by King Charles, released January 2016. Mumford's parents, John and Eleanor (née Weir-Breen), were national leaders of the Vineyard Church (UK and Ireland). In April 2012, he married Carey Mulligan in Somerset. They were childhood pen pals who reconnected as adults. They married a few weeks after working together on the Coen brothers film Inside Llewyn Davis. They have two children, born in 2015 and 2017. ^ "Songwriter/Composer: Mumford Marcus Oliver Johnstone". Broadcast Music, Inc. (BMI). Retrieved 25 April 2015. ^ "Marcus Mumford on why he loves being in-studio right now, and how to pronounce 'New Orleans'". Retrieved 26 October 2016. ^ a b "Jared Sagal interviews Mumford and Sons Exclusive". YouTube. Retrieved 1 October 2012. ^ Eden, Richard (22 September 2013). "How Mumford & Sons brother tackled thug in street assault". Daily Telegraph. UK. Retrieved 20 November 2014. ^ Pearson, Rick (11 September 2009). "The bookshop band Mumford & Sons". Evening Standard. UK. Retrieved 1 October 2012. ^ Walker, Tim (6 February 2009). "Folk music in the city". 'The Independent. UK. Archived from the original on 15 January 2010. ^ 30 Under 30:Music Forbes.com; retrieved 1 April 2013. ^ MARCUS MUMFORD, ADELE, ONE DIRECTION INCLUDED IN NEW FORBES LIST, Gigwise.com, 19 December 2012; retrieved 1 April 2013. ^ "Inside Llewyn Davis (2013) - Full Cast & Crew". IMDb.com. Retrieved 6 December 2017. ^ "Listen to and Pre-Order Lost on the River by The New Basement Tapes (ft. Marcus Mumford)". MumsonFans.com. 19 August 2014. ^ "New Release: Marcus Mumford takes lead on "When I Get My Hands on You"". MumsonFans.com. 23 September 2014. ^ "Wilder Mind - Mumford & Sons". Allmusic. Retrieved 18 July 2016. ^ "Inside Mumford & Sons' Wildly Experimental Fourth Album 'Delta'". 20 September 2018. ^ "Hear Letts' Surging, Marcus Mumford-Produced 'Emeralds'". www.rollingstone.com. 13 January 2015. Retrieved 15 May 2015. ^ "King Charles on making his album with Marcus Mumford – video interview". www.qthemusic.com. Retrieved 26 April 2016. ^ "No 18 February 2002". Jstepney.pwp.blueyonder.co.uk. 18 February 2002. Retrieved 1 October 2012. ^ Fisher, Alice (30 May 2010). "Mumford & Sons: sound of the summer". The Guardian. London, UK. ^ Lavinthal, Andrea (21 April 2012). "Exclusive: Carey Mulligan Marries Marcus Mumford!". Us Weekly. Wenner Media LLC. Retrieved 21 April 2012. ^ Marcus, Stephanie (4 August 2011). "Marcus Mumford Gets Engaged to Carey Mulligan". Rolling Stone. Retrieved 4 August 2011. ^ Perpetua, Matthew (21 April 2012). "Carey Mulligan Marries Marcus Mumford: Actress Weds Musician In England". Huffington Post. Retrieved 21 April 2012. ^ "Carey Mulligan Has Given Birth to Her Second Child". Vogue. Retrieved 6 February 2018. ^ "Carey Mulligan's Mudbound miscarriage scene 'felt very real'". Film-News.co.uk. Retrieved 6 February 2018.